It's not eggactly(The puns will stop over my dead body!!!) finished yet, I'll work on it more this weekend. I wish I had a jumbo sized one. (Note the red hue is artificial but close to how it looks, the flash on my camera completely rapes the glow of the egg). Well the weird thing is if the light source is inside the egg it stops working completely, which I don't know hardly anything about EM fields or whatever is involved to even hazard a guess as to why this is. 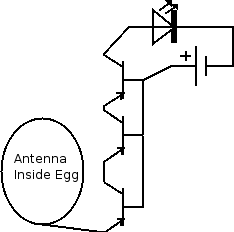 The original picture is just an antenna in one egg and the light in another, which worked as expected(Getting near the unlit egg lit the other one). Right now I have no clue what I'm doing with it, I'm trying to use spare parts I have to make an egg do something interesting, but I'm missing a lot of essential stuff(Timers, op-amps, etc). 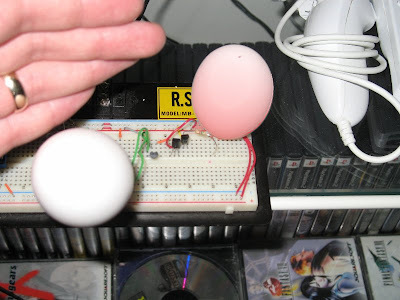 One thought was maybe make an EMI sensor, where the egg glows brighter the more there is....I'll just have to see if I can find another handfull of transistors to get it that sensitive. WTF are you doing to those poor innocent eggs?